As a child I loved reading, every night I would take myself to bed with a book and would spend a frantic hour desperately reading as much as I could before Mum or Dad would appear to switch my light off, even then I quite often sneakily carried on reading under the duvet by torch light trying to get to the end of the next chapter before going to sleep. I loved adventure books and along with many other children my age adored getting lost in the worlds created by Enid Blyton. Unfortunately as I grew older and entered my teens my passion for reading got slightly lost and was replaced by hanging out with friends and working hard for my exams which a few years later turned into hanging out with friends and working in an office. Reading is something I'm always wanting to get myself back into, demonstrated by my shelf of unread books. I read quite a bit last Summer when we had lovely weather so am hoping that when the thick Winter tights come off this year that I'll also reach for my forgotten books and start reading again. 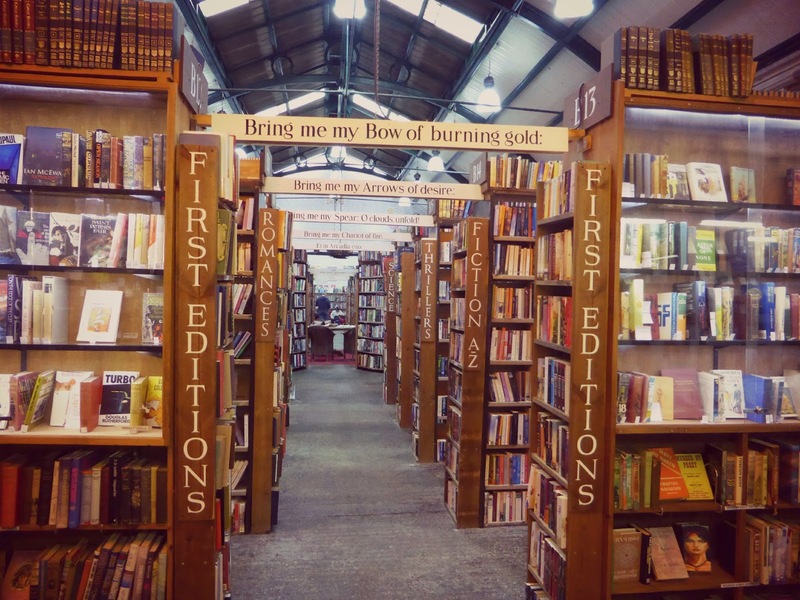 To fuel my desire to get back into my old favourite hobby I recently found myself in Barter Books, a second hand bookshop in Alnwick, Northumberland which is an absolute paradise for book lovers or anyone wanting to rediscover their reading mojo. 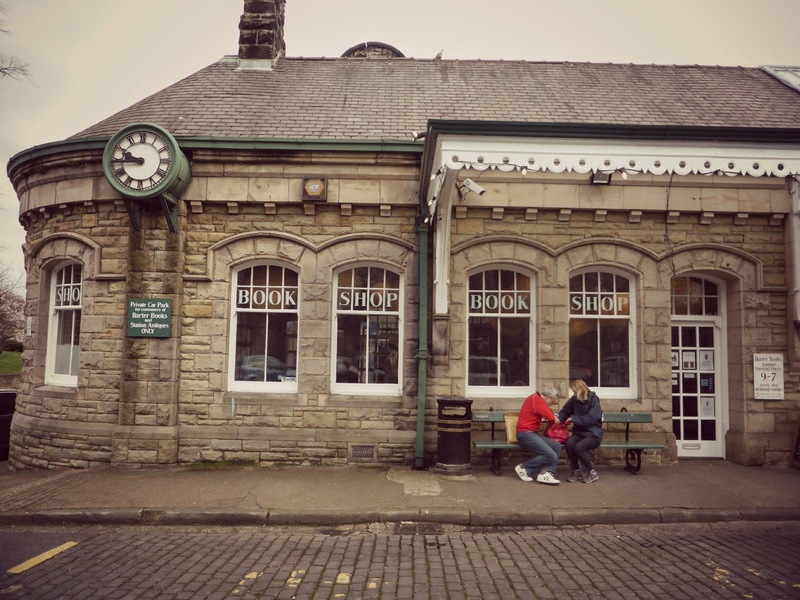 Its beautiful home is in the old Alnwick railway station and there are several nods to the building's former life with a model train running round on a track above your head and various pieces of memorabilia dotted around the shop. 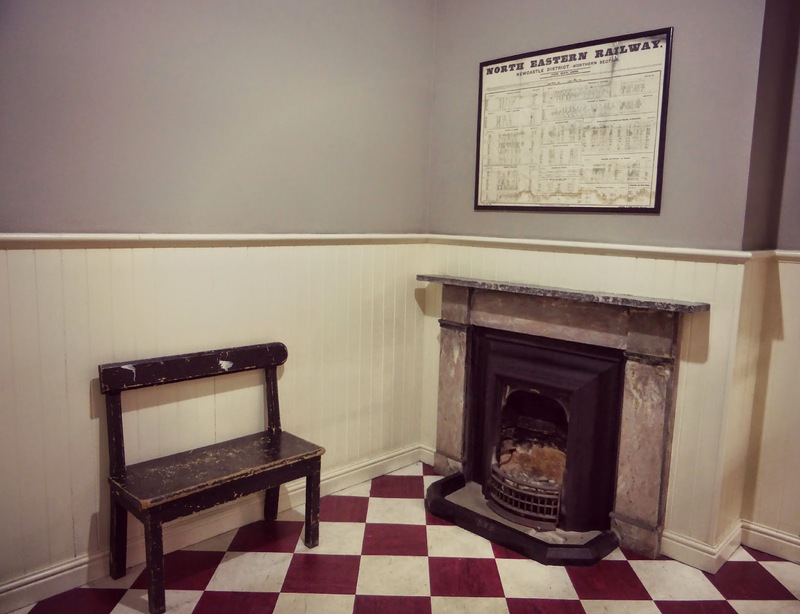 Much of the building has stayed the same including the old waiting room which is now a reading area complete with comfy seats and open fire. It is the perfect place to relax and get completely lost in a book. Unfortunately this time I didn't have the time to stop and unwind but I did peep my head into the waiting room and loved how quiet it was, it was full of people yet was so still and silent - the perfect place for a read. 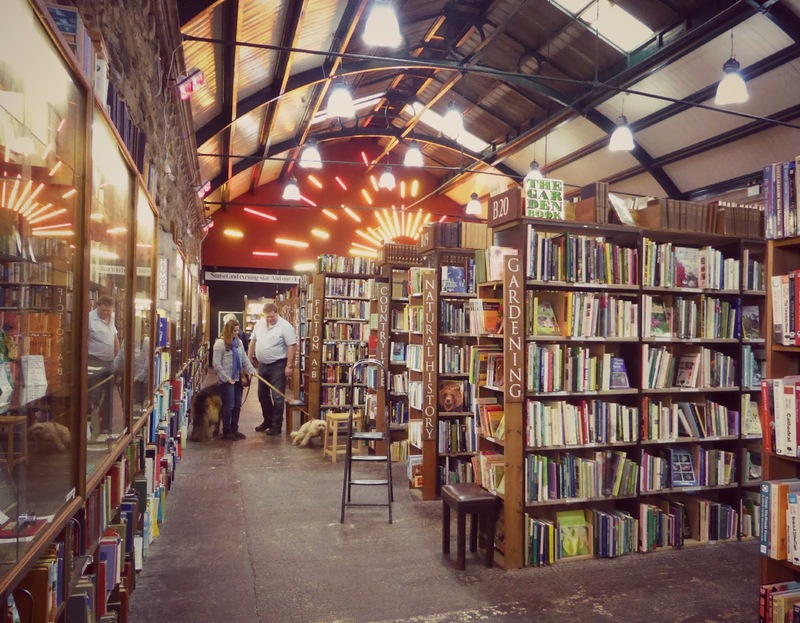 The main space in Barter Books is huge, there are shelves upon shelves of books all organised into different categories. There is something for every taste and so much to look at. I love that the shop is dog friendly, it was hard to know whether to get excited about all the books or all the dogs. 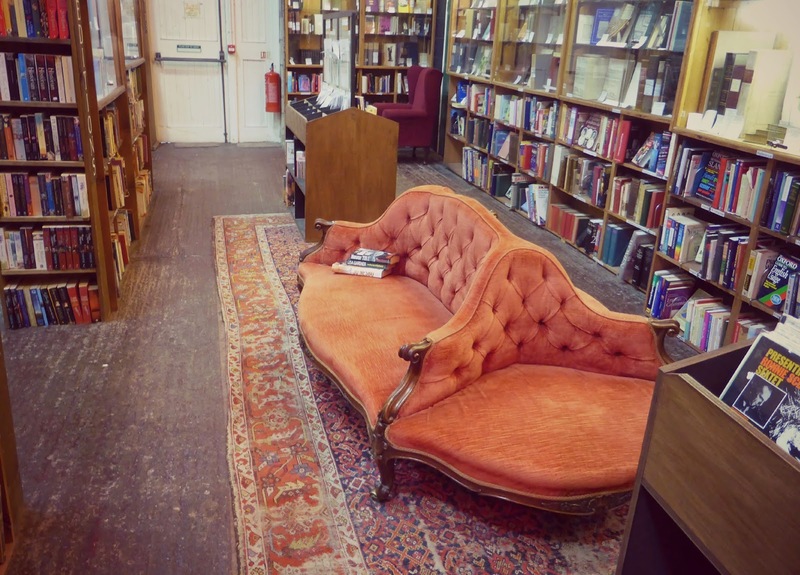 Dotted in between the shelves are lots of comfy chairs inviting you to crash with a book. 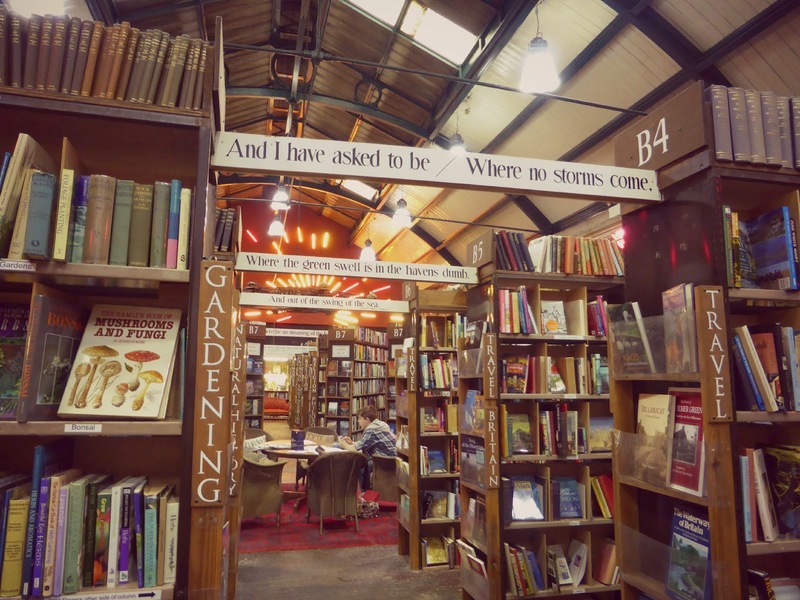 The shop has such a wonderful atmosphere, it feels like a very large old library and the smell of coffee and old books made me feel really happy and nostalgic. In the past I've been pretty guilty of buying brand new books and then letting them sit on my book shelf for ages. Barter encourages people to bring in their unwanted books in exchange for credit to spend on other books in the store. Next time I go on holiday and want some trashy chick lit to take to the beach I know where I'll be heading to stock up! 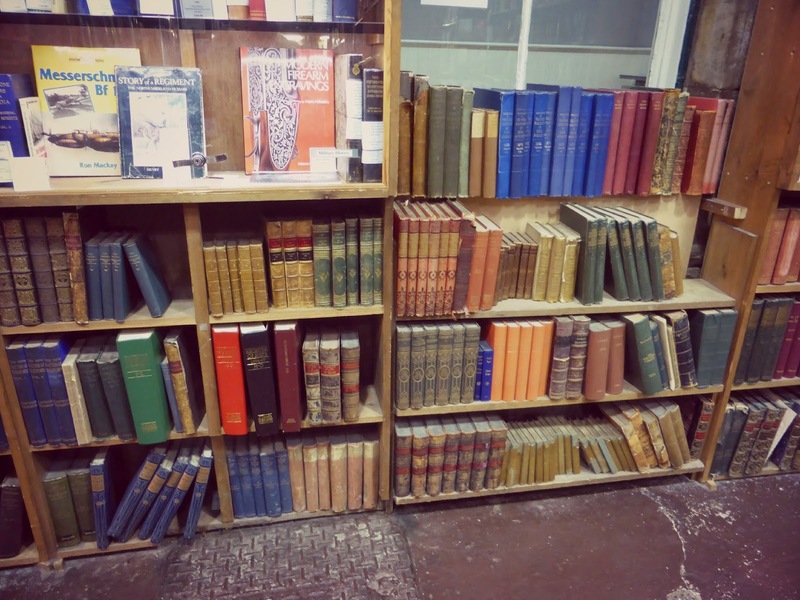 Barter Books also has a wonderful collection of really old books and a pretty cool claim to fame. A few years ago they discovered a rare original of the famous WWII "Keep Calm" poster lying forgotten in a box of old books. You can see the original in the shop and they sell replica posters for you to take home. 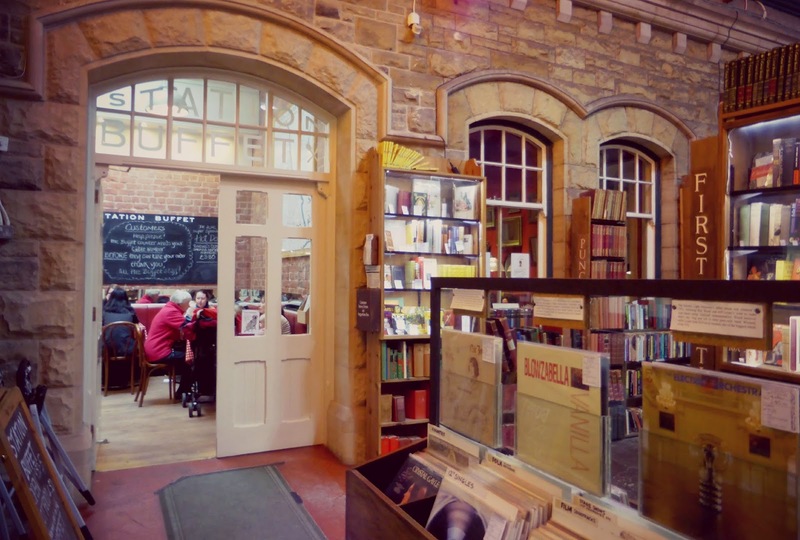 I loved my time at Barter and will definitely be back next time I'm in Alnwick, I can't wait to find myself something new to read and put my feet up with a cup of tea and a slice of cake. Can I move in to this place? Books, dogs, food - is there anything more to life?? I love a quirky book shop but they're so few and far between now, sad face. Wow, what a great place! I could spend hours somewhere like that. 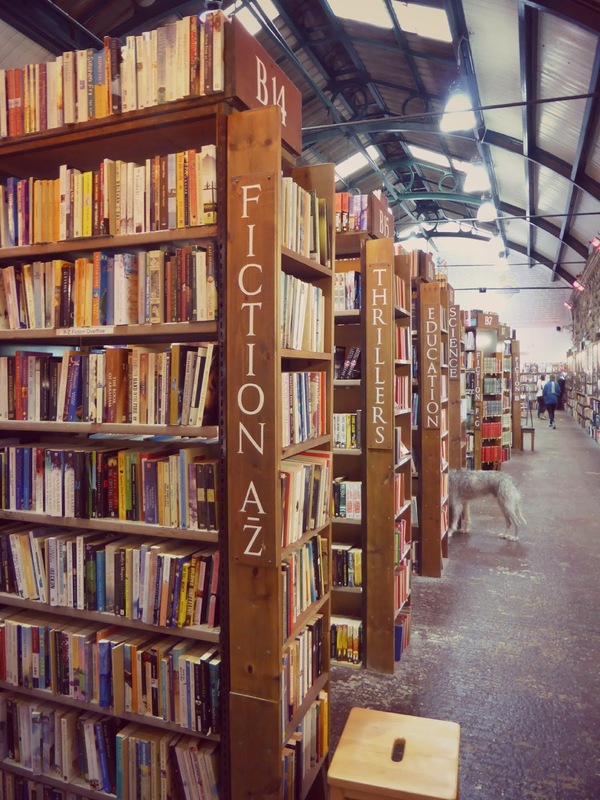 And I loved your photo of the shelves, with the furry back-end sticking out from one of the aisles! Hurrah for dog-friendly shopping. This place is gorgeous! I could spend hours in there! You could spend so many hours in that place - I know I have! I managed to pick up some great vintage books on 1940's and 1930's movies there once, so many others I could have brought too! I can't wait to go back for a proper look! I love, love, love an old-fashioned book shop!! I grew up reading all the time too, I was the child that preferred to be indoors rather than out. Cuddled up and reading a book!! I'm so glad that independent bookshops still exist and Waterstone's isn't taking over the world!! Me too :D My sisters were always out playing and I always preferred to stay indoors with a book! I absolutely love Barter Books! I've spent so much money in there! I need to go back up I have a store card worth £10 up there haha. 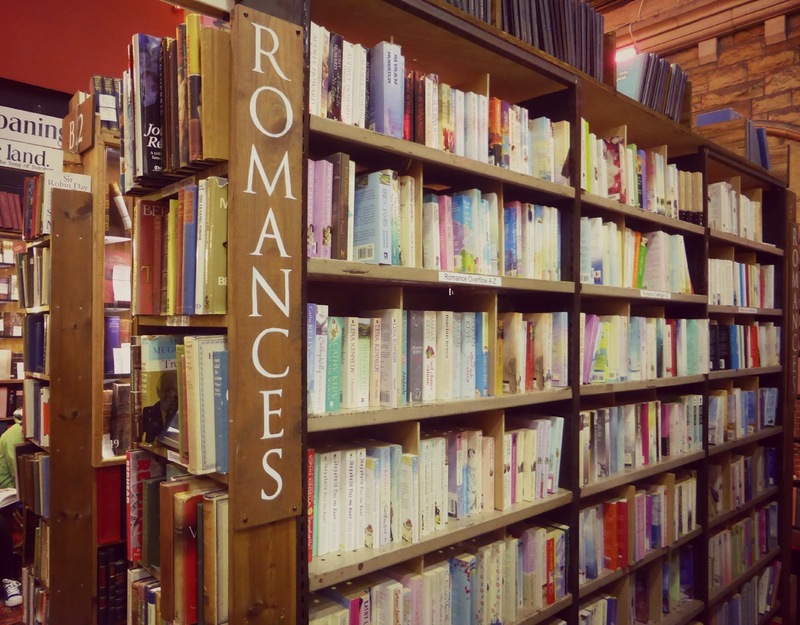 I really wanted to completely ransack that "Romances" section .. I need to go back .. soon! Wow! That looks absolutely magical. I'm trying to get back into reading but am also trying to save money so I'm searching in charity shops rather than buying new so this would be ideal. I was shocked at how huge it was inside, it was book lovers heaven! Oh my! This looks like the ultimate dream bookshop. I think Northumberland has just landed on my 'must visit' list! Yes! This is a good plan .. and of course you must also visit Newcastle at the same time :) Just so much to see and do up here! I realise that I have pretty much commented on every one of your posts from this week but I have been away and I had to comment on this one because I went there last week! It was immense, I loved the train going around the track above your heads too :) I restrained myself and only bought 2 books but I could have gone a bit crazy if I'm honest, I'm a complete book obsessive. Definitely one of my favourite bookshops! That's OK ... I'm not complaining, it's always nice to know that people are reading :) I'm o glad you had a lovely time there, I came away empty handed and I really need to go back, I didn't have nearly enough time to enjoy it properly! This is so adorable! If I had a bookshop I'd want it to look like this!